Super-subs stole the show with late goals on Matchday 2. 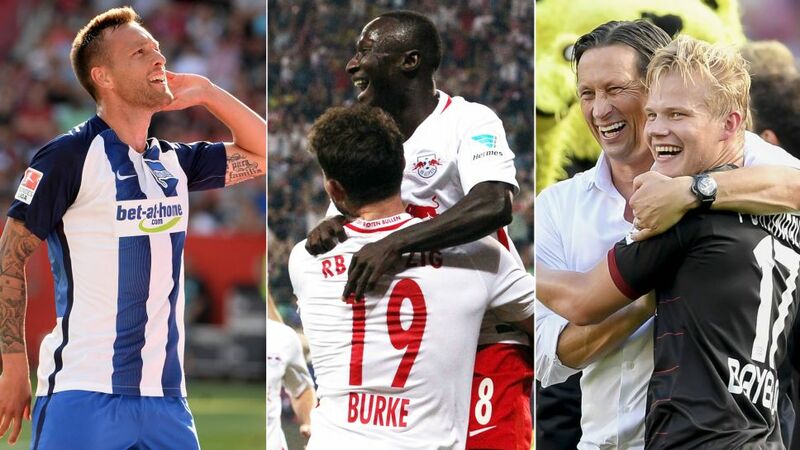 Late drama was the order of the Matchday this weekend in the Bundesliga, with super-subs ensuring eyes were glued to the action right until the final whistle. Matchday 2 belonged to the super-sub. From Joshua Kimmich to Joel Pohjanpalo, via Julian Schieber, Naby Keita, Mark Uth and Nils Petersen, it was a weekend that will live long in the memory for late drama by the bucketload. Substitute Schieber's 86th-minute goal in Hertha Berlin's 2-0 win over FC Ingolstadt 04 on Saturday afternoon means he has scored two goals in only 18 minutes of action this season. Elsewhere, Petersen's penalty six minutes after coming on as an 82nd-minute substitute for SC Freiburg ensured a 3-1 triumph against Borussia Mönchengladbach. Indeed, in total 11 goals were scored by substitutes on Matchday 2 - a Bundesliga record. FC Bayern München, meanwhile, may have found a new scoring sensation to rival the phenomenon that is Robert Lewandowski. Another late substitute, Kimmich rounded off his side's 2-0 win against FC Schalke 04 with a calm finish on Friday night for his first Bundesliga goal – only five days after scoring his first international goal in Germany's 3-0 win against Norway. "Making it 2-0 is always the nicest goal," said Kimmich afterwards. "It gives you a little bit of breathing space. I don't really have a favourite goal of the two, both were equally nice – my first international goal and my first Bundesliga goal." "I got a bit loud in the changing room at half-time," conceded TSG 1899 Hoffenheim coach Julian Nagelsmann. With his side 4-1 down at the break and being outplayed by 1. FSV Mainz 05, as well he might have done. What happened next, though, will go down in Bundesliga folklore. After Mainz's Gaëtan Bussmann was dismissed in the 58th minute, the visitors attacked furiously. It was – unsurprisingly on this weekend – two substitutes who were key as Hoffenheim came back to draw 4-4. First, Uth netted a brace, bringing his side to within a goal of the 05ers, before Adam Szalai popped up in the 84th minute to score his first Bundesliga goal since December 2014 and level proceedings. "We could even have won it at the end," said Nagelsmann. Everyone else, meanwhile, was still trying to catch their breath.